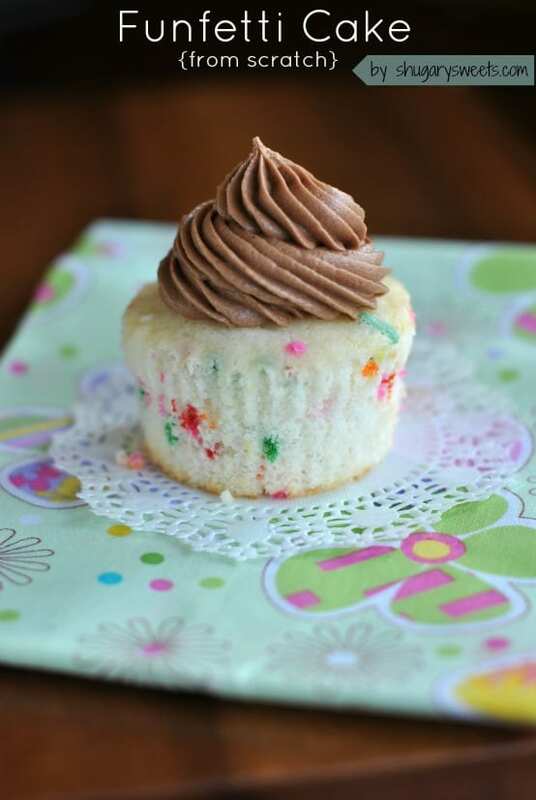 A delicious, from scratch, Funfetti Cupcake recipe with Chocolate Cream Cheese Frosting. 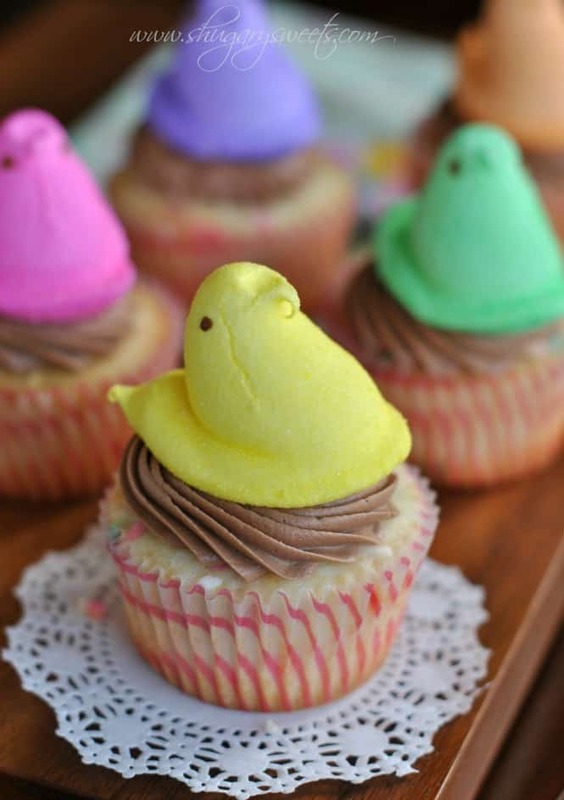 Add a cute PEEP on top for a fun Easter treat! Today is a special day. My baby, my youngest baby, turns 9. As in, NINE YEARS OLD. Did I mention she was my baby? My youngest? And next year that means she will be double digits. So we are celebrating with Funfetti Cupcakes! Most of the time, you will find me making cakes and cupcakes from scratch. It’s not that I have anything against a cake mix, I love them. I just never think to buy them. So when the time comes for cupcakes, I rely on some of my favorite scratch recipes. These are based off my vanilla bean cupcakes. Do you remember those? One of my favorites! I have tried many white cake recipes through the years, and this is hands down my favorite version! It’s so moist, and the crumb is perfect. Seriously. This recipe uses cake flour, which to make the perfect white cake, it really is a must! I wouldn’t make you buy it if I didn’t think it was necessary! I used to swear by Magnolia’s white cake recipe, but I read a reviewer once say it tasted like corn muffins, and the next time I made it the same thought occurred to me! So, here you go, the perfect white cake recipe, with sprinkles!! And to jazz these up a little bit we put some chocolate cream cheese frosting on top. I prefer the big high swirls of frosting. But my little girl prefers the small swirl and a PEEP. And, since it’s her birthday, she can have the moon, the stars and the PEEPS! 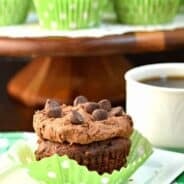 Be sure to check out Desserts-sweets and treats for your next recipe idea! For the cake, whisk together the egg whites and 1/4 cup of the milk in small bowl until slightly combined. Set aside. In mixing bowl, beat butter and sugar for 2 minutes on medium. Add in dry ingredients and mix until combined. Slowly in a steady stream add in the egg white mixture. Beat in remaining milk. Slowly fold in sprinkles. Fill cupcake liners half full with batter and bake in a 350 degree oven for about 15-18 minutes. Remove and cool in pan 5 minutes then transfer to a wire rack. Cool completely before frosting. For the frosting, beat butter and cream cheese for 3-5 minutes, until fluffy. Bean in powdered sugar, cocoa powder, chocolate syrup and 1 Tbsp milk. Beat for an additional 3-5 minutes, adding more milk to get desired consistency. 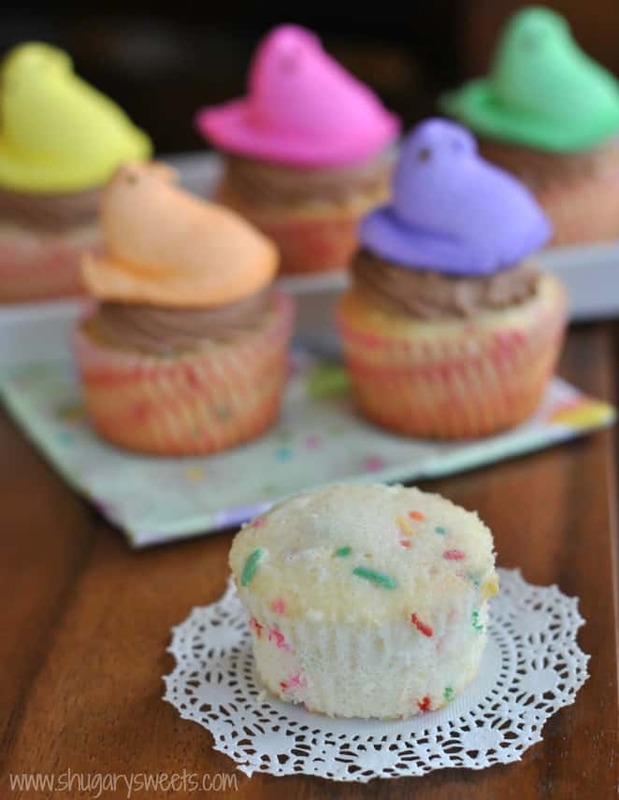 Frost cupcakes and top with a PEEP! 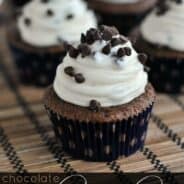 Want more versions of this delicious cupcake recipe? Yeah, I can do that! 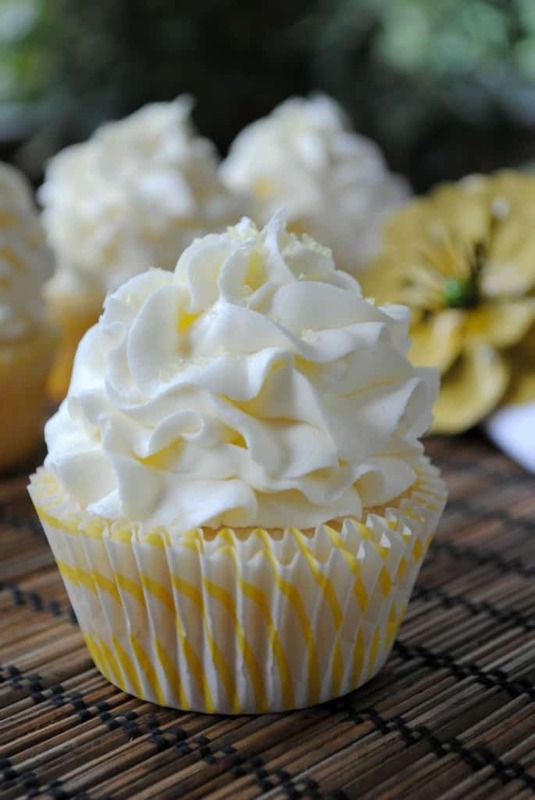 These Lemon Cupcakes are one of my most popular varieties. Using the white cake base, I added fresh lemon to the cupcake and the buttercream. Aren’t they gorgeous? They are delicious too! How about a traditional wedding cake flavor? 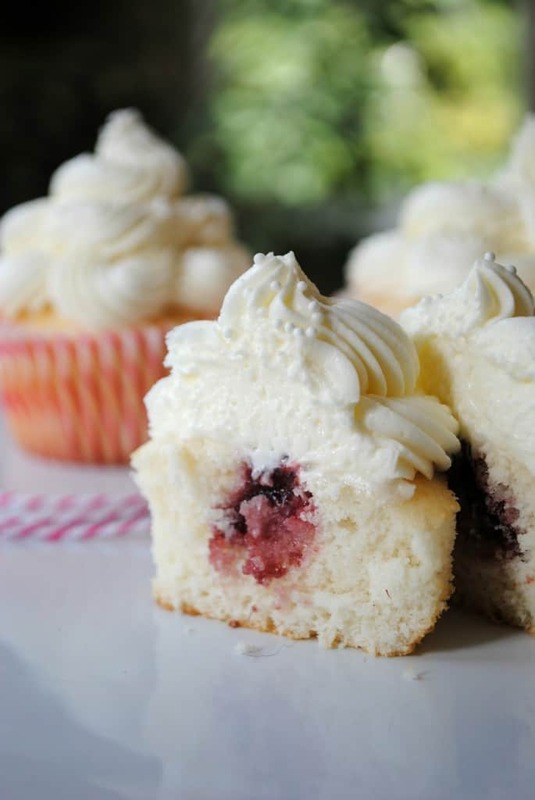 Almond Cupcakes with Raspberry Filling. 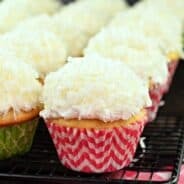 By adding almond extract to the white cake recipe (and to the whipped frosting), these will knock your socks off! 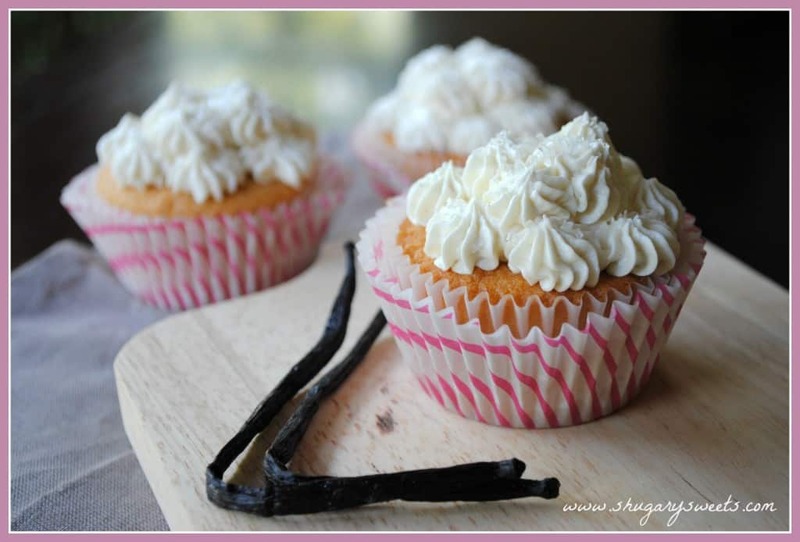 Of course, you may have seen the original Vanilla Bean Cupcakes with Vanilla Bean Buttercream Frosting. Classic and classy! Sorry to those of you who commented and they are now gone! Lost a day’s worth of comments in my migration to a new server! thanks for your patience! Happy Birthday to your daughter! 9 is a great age and some of my favorite memories are from that time period. I love peep on top of the chocolate cream cheese frosting! omg I love love love the Peep on top. 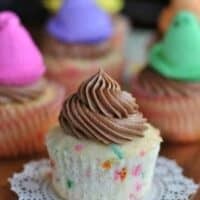 Funfetti cupcakes are already one of my favorite types of cupcakes but Peeps are my absolute fave treat ever. I get all the other holiday versions too but they don’t taste nearly as good as niblbing the head off a peep. Erm, ok a little violent but still – they’re asking for it by staring at me with all their marshmallowy goodness. Happy Birthday to your daughter! These look like wonderful birthday cupcakes. Oh, how sweet. Thank you! ALL of these cupcakes look amazing, but my husband (even though he is almost 30!) still thinks Fun Fetti rules. I’ll have to whip these up for an Easter treat! These looks amazing, so fun 🙂 and happy birthday to your daughter! Thanks girl for the sweet birthday wishes! I replied to your email about the cake flour recipe – I don’t think it went through. Here it is: for every 1 cup of flour in your cake recipe, remove 2 tablespoons of the flour, and replace with 2 tablespoons of cornstarch. Easy! I haven’t bought cake flour in years…and it’s one less thing to think about for your next cake recipe. Happy Birthday to your daughter! 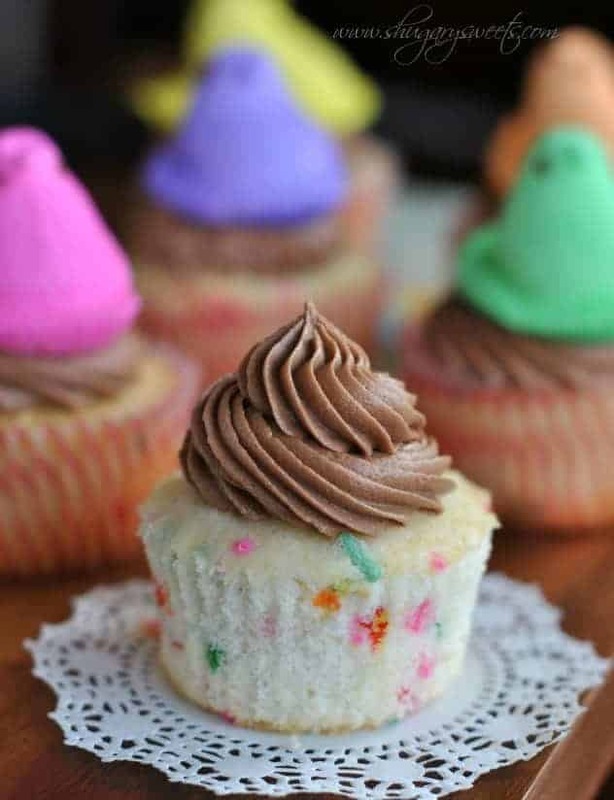 I love funfetti, and those cupcakes with Peeps are too cute! That’s a fun funfetti cupcakes! Every white cake I’ve tried is too crumbly! Yours looks delish and I’m sure the cake flour is the key! Can I use for a layer cake instead of cupcakes? Will it hold up? Thanks for sharing!